I can’t spin it anymore…what’s wrong? A few things could keep you from getting spin on the ball. Poor contact…probably not though. We all practice too much for that to happen. Dirt in the grooves…wrong again. We all diligently clean our clubs after each shot. Poorly fit wedges. The wrong bounce and grind could have some impact on the contact you make with your wedges. Get fit for sure. Worn out grooves. 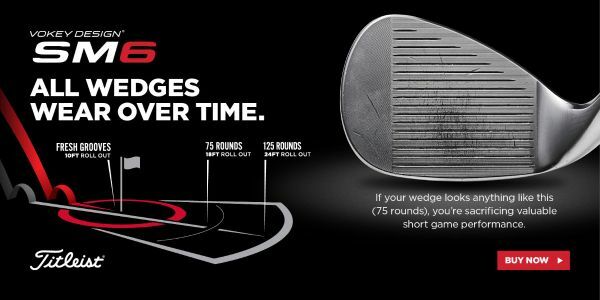 75 rounds may be the magic number to replace wedges with some fresh grooves. I think most of us know the main reason we don’t spin the ball is from poor contact. I also see a lot of dirty grooves while I am working with students on their short game. Keep them clean and keep them dry prior to a shot. lets throw those factors out the window though. They are manageable variables in getting the ball to stop. If your wedges are poorly fit or you have more than 75 rounds on them in might be time to replace those wedges. Left is fresh…right is 75 rounds. I’d like to make that spot in the middle. 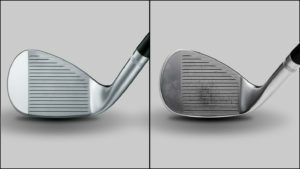 If you decide its time to replace the old for some new wedges then let’s get you fit as well. 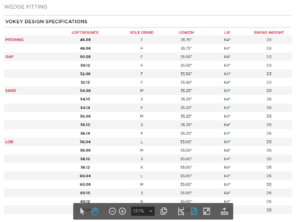 At Carthage Golf Course we have all of the resources to fit you correctly for wedges and give you an opportunity to use the different loft, grinds and bounce angles in a practice session or on the course. 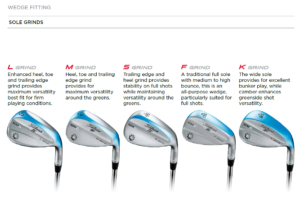 We have a dozen demo/fitting wedges to dial in the right one for you. We have Pro V1 practice balls to use in a fitting and for your trial use of the correctly fit wedge. Maybe you just want to come and try several out at our short game practice green. Take the bag of wedges and the shag bag of V1’s and give them a go. 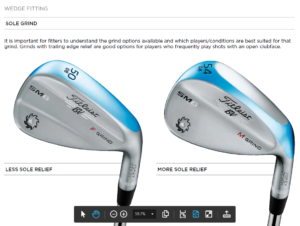 When you are ready to make the move to new wedges let’s do it right! 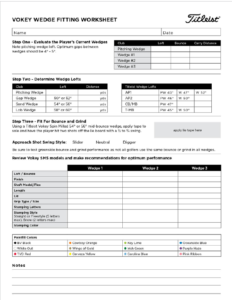 https://www.carthagegolfcourse.com/wp-content/uploads/2017/03/Vokey_SpinWear_GrooveWear_600x300-Folder.jpeg 300 600 Carthage Golf Course https://www.carthagegolfcourse.com/wp-content/uploads/2016/12/Carthage-Golf-Course-logo-300x162.png Carthage Golf Course2017-03-22 07:00:592017-03-19 14:43:05I can't spin it anymore...what's wrong? We will start to aerate greens on March 27th…the dreaded evil necessity of spring. It is time to aerate greens again. The springtime nuisance all golfers deal with. As a player I say nuisance. As a golf course operator I know it is a needed maintenance practice to help maintain quality greens. Kurt Neubert, our GCSAA Superintendent, and Joe Nevills, our incoming GCSAA Superintendent, when Kurt retires in July, have worked diligently to make this a smooth process for the golfers. We will close on March 27th in an effort to get as far as possible in the process without disruption. On March 28th we will have the front 9 open and the back nine closed. The decision of when to aerate greens in mainly based on weather. The greens need to be actively growing for the healing process to begin. While we continue to mow and roll most days there has not been real active growth even with the nice February and March weather. Some rain this week with the warm temps should do the trick. Below is an article from our friends at the USGA that explains the need to aerate. The word aeration stimulates negative emotions for many golfers. It may come as a surprise, but golf course superintendents also dislike aeration. After all, the last person who wants to disrupt the smoothness of the putting greens they work so hard to maintain is the superintendent. Golfers often ask, “Why is aeration needed so often?” Aeration is an essential program to keep playing surfaces healthy and in good condition. Aeration primarily is performed to control organic matter – i.e., decaying roots and grass stems – relieve soil compaction, stimulate root growth and improve drainage. If organic matter becomes too thick, it acts like a sponge and holds water at the surface after rain or irrigation. Excessive organic matter also inhibits root growth, reduces oxygen levels in the soil, encourages disease and eventually can lead to turf failure. Furthermore, excessive organic matter creates soft surfaces prone to ball marks, foot printing and inconsistent playing conditions. Aeration and topdressing are the most effective ways to control organic matter and maintain smooth, firm putting surfaces. 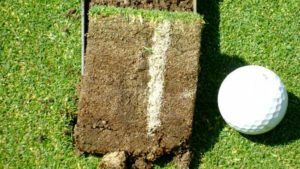 Core aeration involves physically removing small soil cores – e.g., 0.5-inch diameter cores – from the turf and is the most common type of aeration. Aeration holes allow excess moisture to evaporate and promote gas exchange in the soil, resulting in stronger root systems and turf that is better able to tolerate golfer traffic. 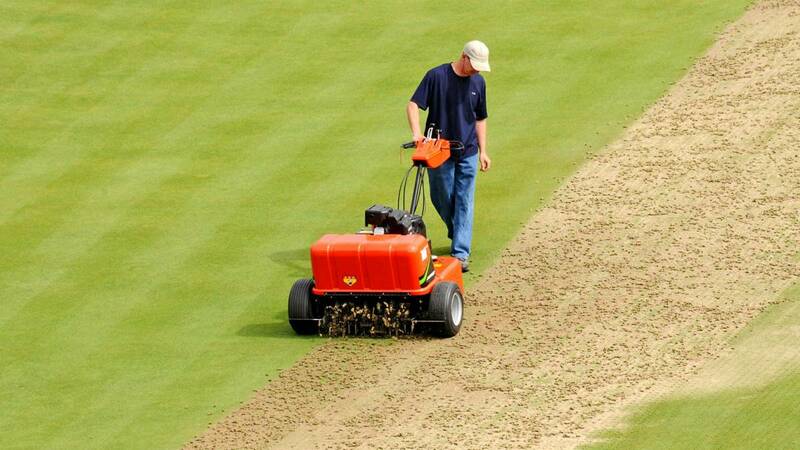 Proper timing of aeration will ensure the fastest possible recovery and return to smooth surface conditions. The key to a quick recovery is to perform aeration when the turf is healthy and actively growing. The articles, Core Cultivation: Timing is Everything and Easing the Pain of Core Aeration expand on proper aeration timing. There are many types of aeration that superintendents use throughout the season; some are more labor-intensive and disruptive to playing surfaces than others. Less-disruptive forms of aeration, including venting aeration with small-diameter, solid tines, also are beneficial because they can alleviate turf stress by promoting oxygen levels in the soil. Aeration programs that have a small impact on a playing surface generally can be performed throughout the season with little or no disruption to play. The type and frequency of aeration needed is course specific. Superintendents adjust aeration programs based on soil conditions, turf requirements, climate/weather, available labor and equipment, course events, etc. Aeration can create short-lived disruption but it is a highly beneficial program that keeps greens healthy and playing well. Playing conditions are of the utmost importance for most golfers, and aeration is needed to keep turf healthy and playing well. Aeration can be disruptive, but the long-term benefits of aeration far outweigh the short-lived disruption. The next time you play on greens that were recently aerated, keep in mind that aeration is performed for the long-term health of the course. The greens may not play their best immediately following some aeration treatments, but everyone is playing the same conditions and golfers still can enjoy the game and make plenty of putts. After all, Tom Watson once shot a 58 when playing at Kansas City Country Club just a few days after the greens had been aerified. Adam Moeller is an agronomist in the Northeast Region. https://www.carthagegolfcourse.com/wp-content/uploads/2017/03/aeration-holes-fill-with-sand-topdressing-770x433.jpg 450 800 Carthage Golf Course https://www.carthagegolfcourse.com/wp-content/uploads/2016/12/Carthage-Golf-Course-logo-300x162.png Carthage Golf Course2017-03-21 08:00:292017-03-19 13:14:09We will start to aerate greens on March 27th...the dreaded evil necessity of spring. Myself and the staff are extremely excited to welcome you back to Carthage Golf Course for the 2017 golf season. We have had a great pre-season with the fantastic February and March weather. We will all be ready for the regular season now. 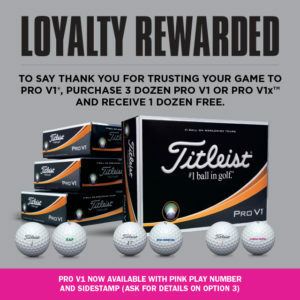 To get your season off to a proper start, we have partnered with Titleist to offer the Pro V1 Loyalty Rewarded Program. Please respond with the specifics of your order and we’ll have them waiting for your Spring play. Personalization: Maximum 3 lines of text with 17 characters per line in black, blue, pink, green or red. Pro V1 Pink is a new option. Pink play numbers and sidestamp. #1-4 only. Thank you as always for your support and we look forward to another outstanding season at Carthage Golf Course. We will order the golf balls for you. 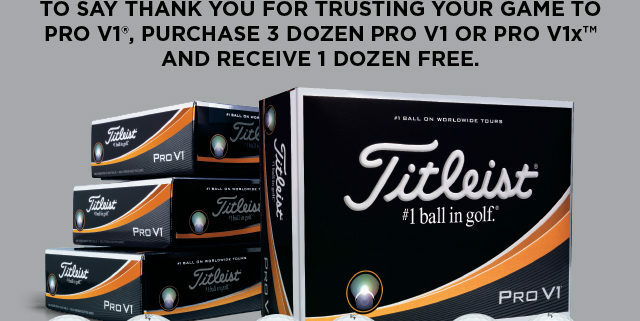 You may pick them up at the pro shop and pay for them at that time or we can ship them to you directly from Titleist. Shipping is free! On orders shipped to you we would charge your credit card when ordering.